Brandon Marshall has stoked up the fire in the Bear-Packer rivalry. 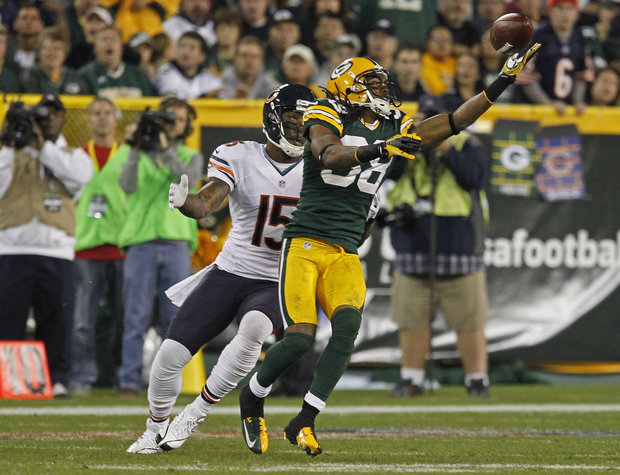 Brandon Marshall wants to beat Green Bay as much as Bear fans. 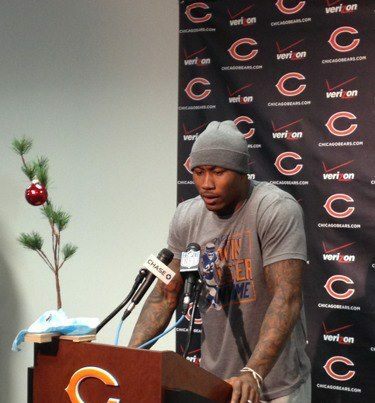 Brandon Marshall likens the Bears situation to a Charlie Brown Christmas tree. After a trade, a mini-camp, training camps and 13 games, the light bulb has finally turned on for me regarding Bears wide receiver Brandon Marshall. When Marshall became a Bear his resume made him interesting, although many were wary. But Bears media and fans have never seen a receiver do what Marshall has done on this team’s football field. And now, as the season is winding down, Marshall is having a record-breaking season. He makes plays with two or three defenders on him. Now, Brandon and Jay are the Bears offense. Then there&apos;s Brandon&apos;s dealings with the press. Week in and week out Brandon talks to the media after teammate Jay Cutler. Marshall is jovial and forthright in his comments — about everything and anything. At the beginning of his first press conference, he took out his phone, snapped the media&apos;s photo and tweeted it — clever and funny. This week has been a difficult one for the Bears; the team has been spiraling downward after another loss and the gloom has been palpable. It&apos;s also Packers week. If the Bears can&apos;t beat the division leader on Sunday the possibility for a playoff berth gets fainter. To acknowledge this, Marshall entered into the media room Wednesday with a Charlie Brown’s Christmas tree meant to symbolize the Bears&apos; situation. He knows things are bleak, but he wanted to show hope and lighten the moment. As the media session continued, Marshall showed something that is rarely heard or seen from this team: passion. That is not to say the rest of the team doesn’t have it, but we don’t get exposed to those emotions often. Think about it: Jay Cutler and Lovie Smith. . . passionate? We see toughness and grit with the Bears defenders, and players talk about not liking Green Bay. Marshall, however, was adamant about it. “I don’t like Green Bay,” he said. "We have to whatever we need to get a win." "This is the biggest game of my career," Marshall added. "This is personal to me." The Bears receiver knows a win would help him get to the playoffs for the first time in his career. He also knows a loss will make the road more difficult. If this doesn’t endear him to the Bears faithful, what will? It may be fool’s errand for Marshall to say what he did — you can bet that the Packers will have his comments on a bulletin board or retort with their comments. But who cares? He is showing fire for a team beaten and battered, and he needs to throw everything he&apos;s got at the team standing in the way of post-season play. Bears head coach Lovie Smith listed three objectives when he took the job as the Bears head coach: Beat Green Bay, win the NFC North division and win the Super Bowl. Marshall is one of the first players to passionately addressed those desires: On the base of that press conference Christmas tree Marshall placed a small replica of the Super Bowl trophy. Like that tree, the Bears&apos; chances of reaching the big game are slim. But you have to give Brandon Marshall credit. He believes in the Bears and can’t stand the Packers. This kind of moxie not been seen at Halas Hall in years. The true mettle of a player is revealed under adversity. In this case Brandon Marshall didn’t duck and hide. He is front and center — you have to respect that.